There’s an old-fashioned idea that the only relationship which matters is the one between the person living with dementia and the medical Doctor. I oompletely sympathise with the concern surrounding the idea ‘we are all patients now’, where, for example, people experiencing memory problems as a natural part of ageing get overmedicalised as ‘dementia’, perhaps for the purpose of hitting a national target: that well people are in fact the undiagnosed ones. But, likewise, my own experience as a person living with physical disability is that we are all persons who become patients at the point of becoming ill. I therefore think the term ‘patient leader’ is outdated, unless there is a specific group of people who only consider themselves ill.
A person coming into contact with the health and care services currently do so from the point of a possible diagnosis. Results from the study from Zaketa and Carpenter (2010) were also actively seeking evaluation of their cognition and were subsequently diagnosed relatively early in their disease progression appear to suggest that physicians do not utilise patient-centered behavious such as emotional rapport building at first. Only once patients and carers are experiencing and demonstrating overt distress associated with more severe symptoms, or as physicians are delivering more dire news regarding the patient’s prognosis and ability to live independently, does a three-way relationship begin to kick in. Hubbard and colleagues (Hubbard et al., 2009) had concluded that carers are involved in treatment decision-making in cancer care and contribute to the involvement of patients through their actions during, before and after consultations with clinicians. Carers can act as funnels for information from patient to clinician and from clinician to patient. They can also act as facilitators during deliberations, helping patients to consider whether to have treatment or not and which treatment. And English dementia policy can learn usefully not only from cancer. In paediatrics, De Civita and Dobkin (2009) revisited the term “triadic partnership”, in referring to “the therapeutic triangle in medicine that includes the carer, child, and medical team in facilitating adherence to treatment”. Optimal health, one may argue, is achieved when patients, carers, and health care providers collaborate in designing a manageable treatment program (Rapoff, 1999). This in time may impact on the policy for self-care. According to Strachan and colleagues, a better understanding of the individual factors that influence heart failure self-care is necessary for interventions to be more responsive to the needs and preferences of patients (Strachan et al., 2013). Individual factors known to affect heart failure self-care are thought to include the individual’s ability to manage comorbid conditions, depression or anxiety, sleep disturbances, age/developmental issues, levels of cognitive function, and health literacy (Riegel et al., 2009). But people are increasingly cognisant of the milieu of the effects of other agents. The purpose of the analysis by Dalton (2002) is to describe the construction and initial testing of the theory of collaborative decision-making in nursing practice for a triad. The inclusion of a third person (family carer) in the theory required the addition of concepts about the carer, coalition formation, and nurse and carer outcomes. And other groups of patients can also helpfully inform on this debate. Patients themselves are increasingly been seen as critical ‘partners in care’. Hirsch and colleagues have outlined reasons why partners-in-care approaches are important idiopathic Parkinson’s disease, including the need to increase social capital, which deals with issues of trust and the value of social networks in linking members of a community (Hirsch et al., 2013). Primary care visits of patients with dementia of the Alzheimer type (DAT) often involve communication among patients, family carers, and primary care physicians (PCPs). The objective of the study by Schmidt and colleagues was to understand the nature of each individual’s verbal participation in these triadic interactions (Schmidt, Lingler and Schulz, 2009). Carers of DAT patients and PCPs maintain active, coordinated verbal participation in primary care visits while patients participate less. Interestingly, the carers’ verbal participation in triadic interaction was found to be also related to their reports of satisfaction with the primary care visit, specifically their satisfaction with interpersonal treatment of the patient with DAT by the PCPs. The literature is becoming, however, increasingly vigilant of the cautions in observing patient satisfaction as the outcome for a clinical consultation. 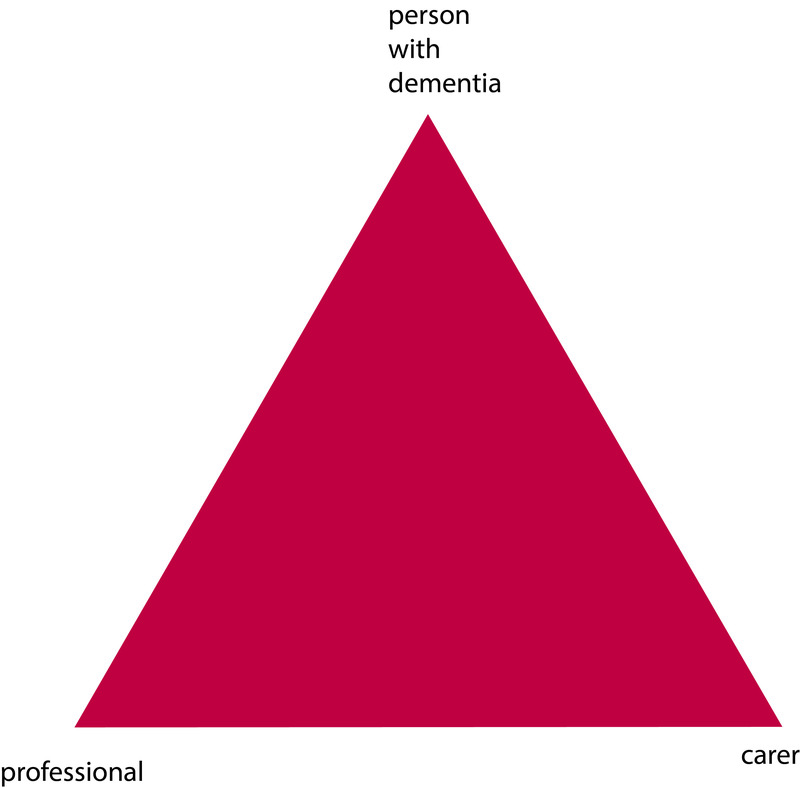 In a study from Sakai and Carpenter (2011), videotapes of dementia diagnosis disclosure sessions were reviewed to examine linguistic features of 86 physician–patient–companion triads. Verbal dominance and pronoun use were measured as indications of power. Physicians dominated the conversation, speaking 83% of the total time. Evaluating patient expectations and preferences regarding physician communication style may be the most effective way of promoting patient-centered healthcare communication. To explore and gain further insight into the nature of the triadic interaction among patients, companions and physicians in first-time diagnostic disclosure encounters of Alzheimer’s disease in memory-clinic visits were studied by Karnieli and colleagues (Karnieli-Miller et al., 2012). Twenty-five real-time observations of actual triadic encounters by six different physicians were analysed, The authors found that an effective and empathic management of a triadic communication that avoids unnecessary interruptions and frustrations requires specific communication skills (e.g., explaining the rules and order of the conversation). Previous PostPresentations by Shibley Rahman at the Alzheimer Europe conference 2014 on autonomy and dignityNext PostIs there more to influencing English dementia policy than putting up a poster?